Music Theatre International Acquires Licensing Rights to Lerner & Loewe's My Fair Lady, Brigadoon, Camelot, Paint Your Wagon, and The Day Before Spring. Drew Cohen, President of Music Theatre International (MTI), announced today that MTI will represent the secondary stage performance rights to five musicals by the legendary writing team of Lerner & Loewe, including their masterpiece My Fair Lady, the beloved classics Camelot, Brigadoon and Paint Your Wagon, and their newly-restored early work, The Day Before Spring. MTI, from June 1, will begin representing My Fair Lady in the US, the UK, and all English-language territories, and will represent the four other titles on a worldwide basis. (Some restrictions may apply). The collaboration of librettist-lyricist Alan Jay Lerner (1918-86) and composer Frederick Loewe (1901-88) defined wit and glamour in the golden era of the Broadway and Hollywood musical. Winners of multiple Oscars, Tonys, Golden Globe and Olivier Awards, their timeless and romantic musicals include such songbook standards as: "Almost Like Being in Love" and "The Heather on the Hill" (Brigadoon, 1947); "They Call the Wind Maria," "Wand'rin' Star" (Paint Your Wagon, 1951); "Wouldn't It Be Loverly?," "With a Little Bit of Luck," "I Could Have Danced All Night," "On the Street Where You Live" (My Fair Lady, 1956); and "Camelot," "If Ever I Would Leave You," “How to Handle a Woman,” and "I Loved You Once in Silence" (Camelot, 1960). 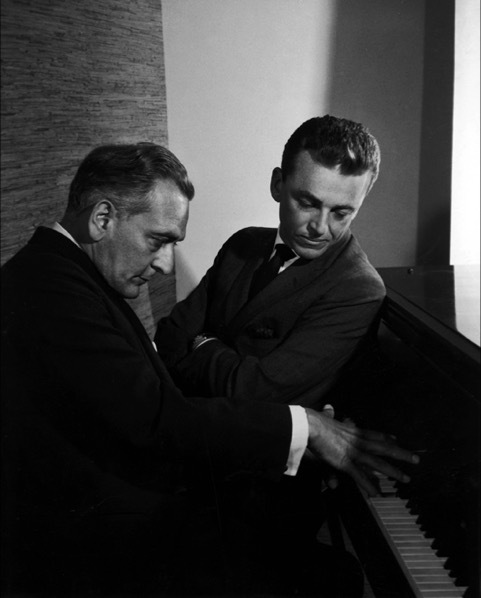 Frederick Loewe and Alan Jay Lerner. The newest addition to the canon is also one of the oldest: The Day Before Spring (1945) had a short Broadway run, and was never recorded or fully revived, but has enjoyed select concert re-appearances at New York's Bandwagon (1990), the York Theatre, New York (2007), Lost Musicals, London (2010), and the University of Sheffield, England (2017). Its representation by MTI will mark the musical's first release in the secondary market. MTI Chairman and CEO Freddie Gershon offered, "A toast to our new family members, Messrs. Lerner and Loewe: We're so glad you sought to fly…/And we know the reason why…/You're part of MTI/Now we're all on the street where you live/(What a great way to celebrate Eliza Doolittle Day!)" 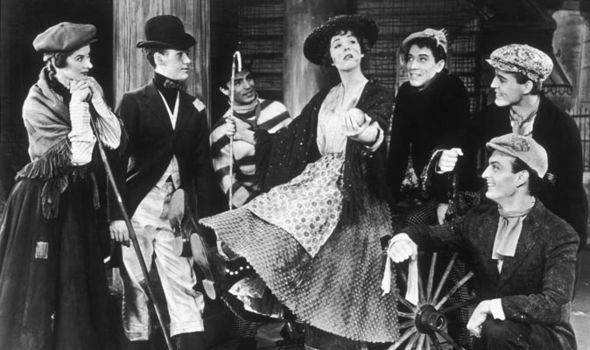 Julie Andrews and cast in the original production of My Fair Lady. Read the latest Filichia Feature all about Lerner & Loewe.